This past week, there has been talk about how the Saturday Morning Cartoon is dead. See NPR’s sendoff at ‘That’s All Folks:’ Saturday Morning Cartoons Bid Farewell. Last weekend was the first time in 50 years in which there wasn’t a block of cartoons broadcast on television. While cartoons were used to sell sugary cereal and toys to children, they were a great opportunity to teach a receptive audience. Many of those shows were some of the only stories children heard, and they often featured public service announcements afterwards, which were little nuggets of education. Popeye told you to wear your seatbelt even on short car rides. G.I. Joe told you that swimming during a thunderstorm is a bad idea. Inspector Gadget even demonstrated how to get a foreign particle out of your eye by allowing your own tears to wash it away. There were often anti-drug PSAs during the commercials. Often the stories themselves were packaged lessons, a modern day Aesop’s fables. 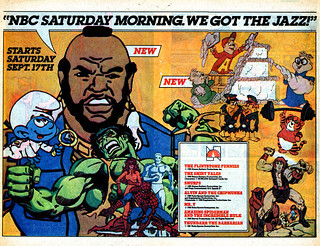 Even if you weren’t fighting ghosts with Slimer or writing home from Camp Candy, Saturday morning cartoons were arming us for life. That said, I suppose when your cellphone is for all intents and purposes a Junior Woodchucks Guidebook, you might not need them anymore. But I think we have a question to answer: what stories are today’s children hearing instead?